Jesus's words of wisdom can become a companion on your own spiritual journey. The gospels of Matthew, Mark, Luke and John are not the only record we have of the words spoken by Jesus. Designed to challenge, enlighten and inspire, they are also quoted in a wide variety of other ancient sources--including the Qur'an, writings by early Christian church fathers, and fragments of lost gospels only recently discovered. Some of these sayings are familiar; many are surprising; all expand our conventional understanding of the scope and essence of Jesus's original teachings. More than a "Christian" compilation, this collection of more than three hundred sayings reveals a Jesus whose words encapsulate spiritual truths that resonate across religious boundaries. From the encouraging "I am hope for the hopeless," to the wise and practical "Love those who hate you and you will not have an enemy," to the candid "Give no opportunity to the evil one," these pointed sayings not only reveal how Jesus was understood and portrayed across a wide variety of cultures long ago--they will also penetrate to your heart, challenge your assumptions, and energize your own spiritual quest. 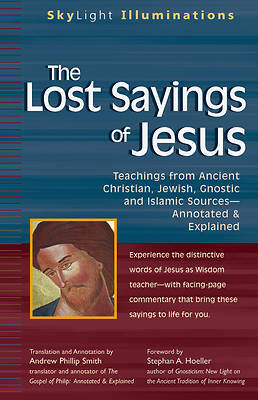 Now you can experience the wisdom and power of Jesus's sayings even if you have no previous knowledge of these little-known texts.